Byron Bay-based singer-songwriter Steve Tyson has travelled the world, taking his music to Europe on eight tours and playing at some of the great international folk and roots festivals. 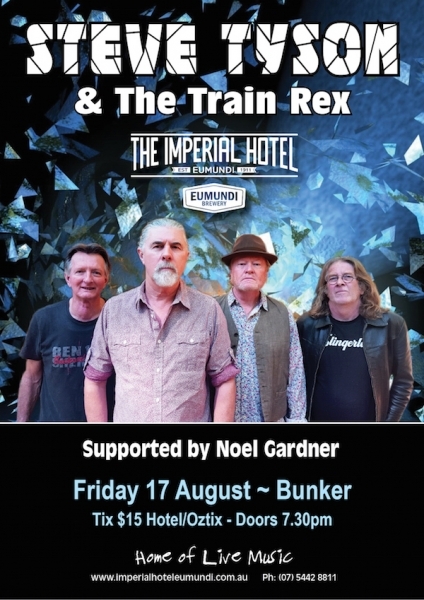 He'll be taking to the stage in The Bunker at The Imperial Hotel Eumundi on Friday 17 August with his band The Train Rex, supported by Sunshine Coast singer songwriter Noel Gardner. Tyson has released three critically acclaimed albums, scoring 4 star reviews in the national music press. His latest album is Wrong Train Right Station. “Steve Tyson does darkness very well with regret-tinged songs of missed chances and jealous-rage murder tales, but he balances these with songs with a twinkle in the eye or tongue in cheek. The wry and dark humour is never far from the surface, and the DIY aesthetic gives plenty of room for Tyson’s powerful guitar work. The tracks on this third solo set reveal a master song craftsman with a nuanced lyrical touch and strong melodies. There is always plenty of grit in the musical delivery here. Nothing is over-polished, but these are songs that are built to last”. Tyson delivers live with passion, soul, humour, and fine musicianship, joined on stage by his band The Train Rex featuring bass player John Barr, drummer Andy Kirkcaldy and guitarist Ian Shawsmith. He has been called Australia’s Pete Seeger, and the Sunshine Coast’s Paul Kelly – and like them, he is probably only appreciated fully by a small proportion of the general population. But that proportion is an important and growing one, and graces Australia’s national folk festival circuit. Noel is the only solo performer to have performed at every one of the 18 Maleny/Woodford Folk Festivals – and his music is as fresh and relevant now as it was in 1989, when he teamed up with Mark Gillett to record the iconic “Watching the Obi Flow’. His capacity to sing of both beauty and injustice is a refreshing reminder to keep thinking about what kind of world we want to live in – and what kind of world we want our kids to inherit from us. In concert, Noel is delightfully understated and it’s a welcome relief. Over the years, Noel has played support for folk like Christy Moore, Paul Kelly, Kev Carmody, Judy Small, Judith Durham, Vin Garbutt and Kristina Olsen. TICKETS: $15 (+ booking fee) through Oztix - CLICK HERE or at the Imperial Hotel (Ph: 5442 8811).